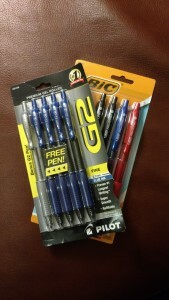 Pilot G-2 07 – The Best Pens Ever? – Planet Geek! Pilot G-2 07 – The Best Pens Ever? I’ll admit it. I hang out with geeks. But not just geeks who love computers or tech or whatever, but also writing geeks, library geeks, and, well, you get the idea. Among the literary circles, I’ve found people sometimes go on and on about a certain pen or pencil they love. This always mystified me, as to me, a pen is a pen, a pencil is a pencil, and the greatest amount of thought I put into the process is trying to figure out where I just put one down. Alas, I may have levelled up. I’ve moved into the realm of “This is something I really like”. About a year and a half ago I started writing a fulltime journal (on paper, sorry, no URL). Naturally, I used whatever pen I had lying around. Somewhere along the line I picked up a Pilot G-2 07 pen, and… wow. I found a pen that was comfortable, had a great flow to it, and looked good. Have I finally gone off the deep end? I found myself two weeks ago placing an order with Amazon to keep a stock of these pens in my carrying bag, and at my desk at work. I have never, ever done this before (okay, qualified – I did it once for mechanical pencils, which I use when sketching out projects), and certainly never for a single style, brand, whatever of pen. Maybe it’s the fact these are ‘gel pens’, which have a smoother stroke than your typical roller ball pen. That combined with a good feel (rubber grip, etc) just make them a joy to use. I’m going on about enjoying using a certain pen. Definitely cracked.